When the little boy in front asked his mum –‘but where are the elephants?’ I knew he was in for a surprise, and maybe not one he would like. No, there are no elephants, so you won’t step in anything nasty, unless there’s been an unfortunate accident and the magnificent man on the flying trapeze just landed with a splat in the middle of the ring. 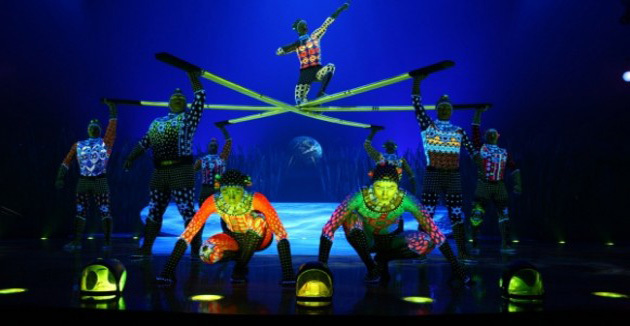 Cirque du Soleil appears in their show stopping set ‘Totem’ at the Royal Albert Hall until mid February 2012. A massive space, they fill it up, no problem, though the underlying theme – the journey of mankind from its ‘original amphibian state to its ultimate desire to fly’ is possibly too deep for me. The world music is inspiring though – Spanish flamenco, Native American, Indian – and the fabulous acrobatics and sensational dancing makes for a singular event. But don’t expect clowns, with a bucket of soapy water – if the thrill of maybe getting soaked is what puts a smile on your face, then stay outside in the rain.